Crude prices are headed higher this morning after some early week sell-off seen on Monday, pushed upward by a supportive API report. Crude traded mostly flat yesterday, though prices were able to eke out a small 10 cent gain before closing. This morning, crude is continuing in the momentum, gaining $1.27 to trade at $67.79. The overnight gain brought prices back to the 2-year record high level seen last week. Refined fuels are also picking up steam this morning following 2-days of steady losses. Diesel prices were up 2.82 cents to trade at $2.0853. Gasoline has gained 2.10 cents this morning to trade at $2.0622. 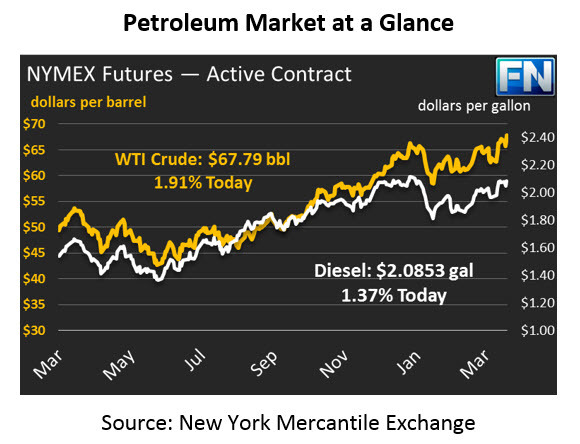 Like crude, product prices received a boost from yesterday’s constructive API report. The API released their weekly data on Tuesday, showing that both crude and product inventories fell last week. Crude inventories fell slightly short of market expectations; however gasoline and diesel outpaced the markets’ outlook. Combined inventory draws were 4.4 MMbbls. Cushing inventories saw their first draw since February, which also aided in the price rebound seen this morning. Cushing stocks are estimated to have fallen by 1.4 MMbbls last week. The EIA report will be published later this morning to verify the actual movement in inventory levels.